There will be several bike pit stops in downtown Salt Lake City in May 19, 2016. Cyclists are encouraged to stop by for coffee, bagels, and other breakfast snacks. In observation of May as Bike Month, Salt Lake City is on a roll. Tomorrow, May 19, from 7 a.m. to 9 a.m., bicyclists can stop by one of seven commuter pit stops for a copy of the city’s new “Bikeways Map,” as well as grab a bite of breakfast on the way to work. 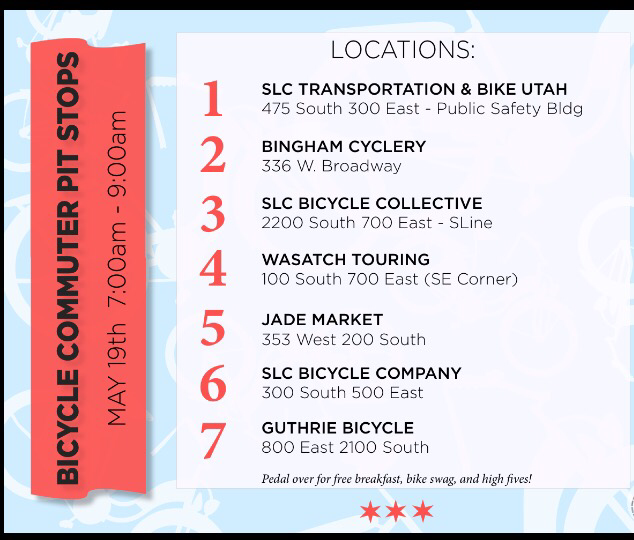 Hosted by Bike Utah, Salt Lake City, Jade Market, and several local bike shops, the pit stops are a perk in recognition of growing numbers of bike commuters. The free maps feature Salt Lake City’s blacktop bike lanes, mountain bike trails, parking lot connections, and proposed future trails. They even include comfort ratings of city roads — from high comfort to extremely low – that take into vehicle traffic levels, noise, road shoulder conditions, and more. In addition, Salt Lake City’s Transportation Division and volunteers from Bike Utah have been busy this week painting chalk messages in city bike lanes to remind cyclists about riding safely and sharing the road. The stencils feature 6-inch-high letters sized for easy reading, and offer tips such as “Use lights at night” and “Wait here for green,” and “Ride with traffic.” The temporary messages will wear off within about two months. The grand finale of Bike Month will be the annual Mayors’ Bike to Work Day on Tuesday, May 31. Salt Lake City Mayor Jackie Biskupski, Salt Lake County Mayor Ben McAdams, and other mayors from throughout the Salt Lake Valley will lead bicyclists from the Sugar House Draw (the bike/pedestrian tunnel under 1300 East and 2150 South), along the S-Line Greenway and the 600 East Bicycle Boulevard, ending at the Salt Lake City and County Building at 400 South and State Street. Bicyclists are encouraged to gather at 7:15 a.m. at the Draw for breakfast and music. The ride will begin at 8 a.m.